Its honey has incredible medicinal properties, capable of restoring severely injured Kreatures to full health. As such, its honey is highly coveted by other Kreatures, especially by its mortal enemy, Vespaclaw. 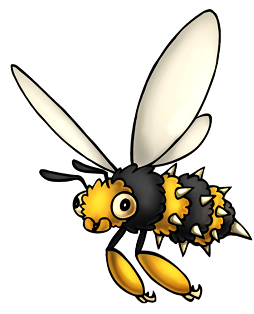 Bumbuzzle will defend its precious honey ferociously using the protective stingers lining its abdomen, which it can fire into an opponent. It will also use kamakaze tactics to explode its own body, flinging deadly supercharged stinger shrapnel in all directions and eventually regenerating from its nucleus. Its wild ancestors are extinct, but the surviving lab-created breed is common and readily goes feral. A solid insect monster. I really like the arms and the hook claws.